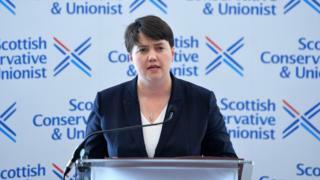 Scottish Conservative leader Ruth Davidson has dismissed reports that Scots Tories might “break away” from the main UK party. She tweeted that she fought a leadership campaign opposing the idea of a separate organisation in Scotland. Tory MSP Murdo Fraser, however, said Scots MPs would “work behind the scenes” to champion Scotland’s interests on issues like immigration. The Scottish Conservatives won an extra 12 seats in Thursday’s election. The performance of Tories north of the border was in marked contrast to that in England and Wales where Prime Minister Theresa May lost her majority in the House of Commons. The Daily Telegraph reported that a strengthened Ms Davidson now wanted to “tear her Scottish party away from English control” after tensions during the campaign, and that her aides were working on a deal to set up a separate organisation in Scotland, albeit with a close relationship with the English party. In an early indication that she might seek a greater influence in the UK party, Ms Davidson said on Friday she had been given assurances that any Conservative deal with the Democratic Unionist Party (DUP) would not affect LGBTI rights. Senior Tory MSP Murdo Fraser – who argued for a separate Scottish organisation when standing for the Scottish leadership against Ms Davidson – said he had been assured “there was not a lot of truth” in reports of plans for a separate party. But Mr Fraser said the new “phalanx” of Scottish Tory MPs would make a “huge difference”, ensuring “the interests of Scotland will be heard much more strongly than ever before”. Speaking on the BBC’s Good Morning Scotland programme he gave the example of the Scottish fishing industry which is anxious about Brexit negotiations. Asked if Scottish Tories would push for a softer line on Brexit, he said: “I think we can have a tremendous amount of leverage. “If you take the interests of Scottish business, sectors like agriculture, food production hospitality – are hugely dependent on access to migrant labour. Interviewed on the same programme, the SNP’s cabinet secretary for finance and the constitution, Derek Mackay, insisted his party had won the election in Scotland, despite seeing its number of MPs fall from 56 to 35. He said it was too early to say whether the SNP would now “park” its demand for a second independence referendum after 60% of Scottish voters backed pro-union parties. “Of course we will listen and reflect. It’s too premature to say what we would do next around that,” he said.